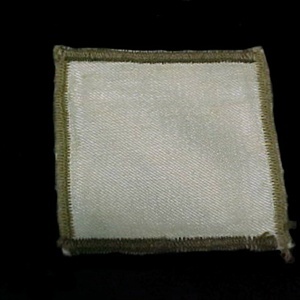 WWII U.S 3rd INFANTRY DIVISION "Theater Made" SILK PATCH, THIS IS AN ITALIAN MADE PATCH IN EXCELLENT USED CONDITION 100% ORIGINAL. 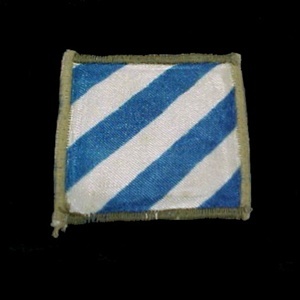 This is an Italian-made shoulder patch for the United States Army 3rd Infantry Division which fought in: AFRICA - ITALY/SICILY/ANZIO - FRANCE. As with all my items listed this piece is guaranteed 100% original WWII Era. The 3rd Infantry Division landed in North Africa in November of 1942. They supported allied attacks in French Morocco and the stronghold of Bizerte. In July of 1943 the 3rd landed on Sicily and later moved to capture Messina. They then landed in Salerno, Italy and fought up the Italian peninsula. They landed at Anzio in January 1944 in an attempt to turn the German defenses south of Rome. In August of 1944, the division made their fourth Amphibious assault when they landed in southern France. They fought through France, Germany and ended their part of the war in Austria. This was the only division to fight the Germans on all four fronts in the ETO They had 34 Medal of Honor winners including Audie Murphy.